ZIMBABWE – They both deny fighting each other although they last met six years ago and hardly speak to each other, even on the phone. Despite “serving a same master — God”, Prophetic Healing and Deliverance (PHD) ministries founder Walter Magaya and his “rival” United Family International Church (Ufic) leader Emmanuel Makandiwa are apparently on a silent war path — fighting for supremacy and dominance in the new crop of pentecostal churches in Zimbabwe. Claiming to perform “astonishing” miracles that include “raising the dead,” production of miracle money and healing the sick of all sorts of ailments, the two appear out to outdo each other in virtually everything they do. The two preachers are backed by their spiritual fathers — Nigerian televangelist TB Joshua for Magaya and Ghanaian Victor Kusi Boateng for Makandiwa. 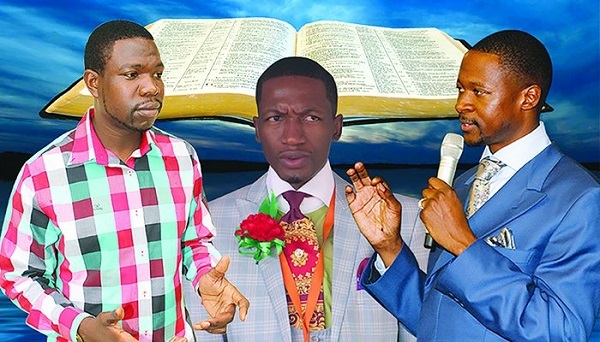 Magaya — known more for prophecy and healing than biblical teachings — admits there is a silent war among pentecostal churches in Zimbabwe, but not specifically with Makandiwa. He charges that some pentecostal churches accuse him of being a Satanist, yet they have no evidence to back up their claims. Makandiwa, although a media shy character, recently claimed that some church had placed an advertisement to congratulate him for coming third in the controversial most influential person awards line up where Magaya came out tops. Although he did not mention any church by name, everything about the allegations pointed to PHD. However, Magaya’s ministry dismissed the claim, saying they were too busy to focus their attention on such issues. Observers contend that the two prophets are locked in a battle for popularity and attracting the largest congregations. Makandiwa was the first to bring to his fold popular musician Leonard Zhakata and Magaya followed suit, taking sungura “senior lecturer” Nicholas Zacharia into his praise-and-worship team. The duel between the prophets has continued to evolve and now plays itself out through malice and ugly plots as camps burn the proverbial midnight oil plotting each other’s downfall. Magaya is now being sued by a Ufic church couple, Upenyu and Blessing Mashangwa, for allegedly making false prosperity promises, including that they would own an airline if they pampered the man of the cloth with expensive vehicles and cash. George Kaseke, a pastor with Glad Tidings said the supposed tussle between the two preachers was a fulfilment of the scriptures which say in the last days there shall be false prophets whose love for money goes beyond their co-business of worshipping God. “If the fight really exists as we are made to believe, then churches should organise a mass prayer as these could be signs of the times,” he said. “It shows that there is an abandonment of the gospel by some preachers as they seek popularity and fame ahead of divine glory. “What we are seeing is a manifestation of what God said; that in the last days people will love money more than God,” Kaseke added. “Until they start to do what they are supposed to do, which is preaching the gospel and delivering souls, the end result will be a shame. Ceaser Magwentshu, a pastor with Apostolic Faith Mission in Zimbabwe, said it was time true prophets stood up and defended their territory. “Most people are out there doing things for money. They don’t have a calling for being whoever they are; so as a church, we must stand up and be counted or else we risk leading our people astray,” he said. “We must test every spirit that claims to be from God. The Bible says from their fruits you shall know them. He told the television station that he led a simple life, different from many calling themselves prophets in Zimbabwe. Magaya reportedly attracts about 250 000 worshipers to his church services in Harare. “Planet Africa is assisting in projects such as building stadiums, residential houses and stimulating entrepreneurship,” Magaya was quoted saying at the time. On the other hand, Makandiwa rarely speaks about his wealth although it is rumoured that he has business interests spanning various sectors of the economy.